Laura Robertson is the editor of The Double Negative, and Open Eye Gallery’s critical-writer-in-residence. This piece was written for the November 2018 issue of TILT, as a response to the writings of Ren Hang. 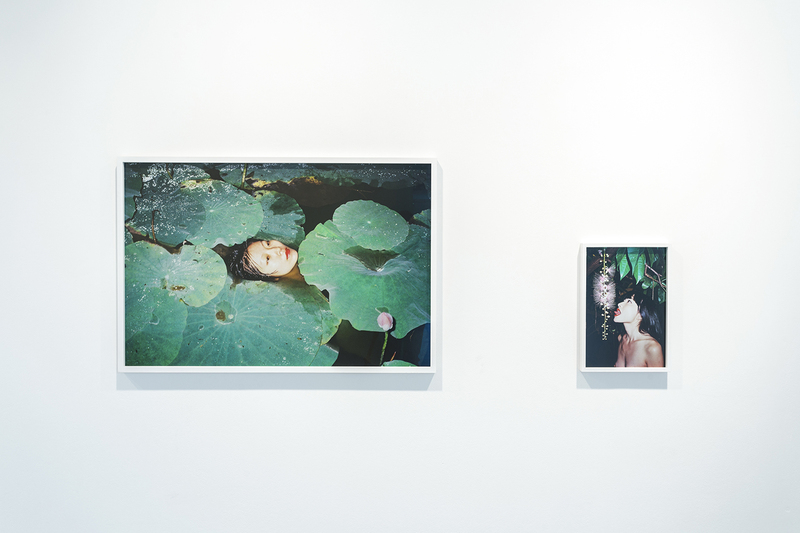 Ren Hang is featured in our exhibition Wake Up Together. As well as making photographs, he also wrote poetry and kept an online journal titled ‘my depression’. I just want to lie down, let myself stretch, feel like I’m extending indefinitely. My body is like a rope constantly being stretched. Watch blankly as I fade into a tiny blur, and then a dot, and then nothing at all, nothingness, into boundless space. I am atomized, a mote to be wafted away. The only urgency is trying to remember why I’m not really here. Here or there. But what is and what was and what shouldn’t be is all stirred up. There’s no corporeality; I’m mid-air, made of air. Nothing can make a dent. I’m something to be observed from afar. I’m dull to the bone, leaden, shipwrecked. I feel that I have become very small. I embrace myself, hard. We’re crying with adrenaline. The apparatus is enormous, towering above us, but we must get to the roof. As we take our positions, I fall. I watch myself sluggishly drop away from me, descending, seeping into the floor, disappearing. We keep eye contact for the whole time. I clamber down, hands slick and grabbing at rungs, tumble to my knees, intending to pull myself back. My hands push through the ground and it gives, soft and dense like treacle. only the after image remains. The floor seals up, solidifies. I pick and claw at the concrete, grating fingertip skin, bending nails, desperately trying to claw my face back. I want to rescue the people trapped in the abyss. All people fall into depths. But I can’t help myself. My life is a bottomless pit. I can only fall. It’s the shuddering at first that stops the breathing: convulsive sobs that grip and squeeze and shake what’s left. Legs retract like the elastic’s been cut. Heels up to my arse, knees either side of my chin, mouth stretched wide trying to draw oxygen in. Wet and slick. Rocking back into an unborn state. A wheeze. A low noise, an animal noise. An emptying out. Sometimes the tentacle reaches out for me: a glutinous, nimble thing. Rasping, terrified, I bat it away as it comes unbearably close to my face. It has never touched me before, but has always been there, I know that now. Maybe it can see the hole where I used to be. and all I can think about is the pressure, the desire to detonate. Let me be reduced to atom state. All people fall into depths. Other people’s bodies are raging; inflamed and dimpled and throbbing. Mine’s a dead weight. I imagine struggling out of the cocoon, touching its weak seams and forcing the rip, casting it off. Considering for a short moment its exterior, woven with twigs to keep people away. Slipping into the heat and friction of someone else’s body, bearing the load, staring out of strange eye sockets. Slithering into rubber gloves and socks, supple and eager to propitiate. Holding someone else’s hand from the inside. To be embraced by another. All embraces are a cell. Supine, running my new skin-gloves over goosebumps. Getting to know its foreign calluses, its raw edges, its hot folds. Rubbing fur the wrong way. Firm, borrowed contours stretched gloriously over mine. I luxuriate in the grip. Delirious, stretching, tongue out and neck arched and toes splayed, feeling the extent of the hold. I’ll lie down in someone else’s body and pretend, for a while, that it’s you.